We all eat dinner together most nights. But in between the girls' slapstick comedy routines and exciting girl drama from the 2nd and 4th grades, it's sometimes had to have conversations of substance. But sometimes, it happens. And while I'm talking to Craig, I think my words are lost in the back and forth banter taking place next to me, but I'm learning they must actually be listening much more than I think they are. Last night, Abby asked me how my day went. And I told her I was really tired. She nodded, and in a very adult voice said, I bet. I went on. I had a hard time deciding what to do. I really wanted to rest, but I have a lot of work to do to get ready for the retreat. She interjects: What did you choose, Mom? Well, I say, I chose work. Awwww, Mom. Haven't you learned? Do you really think you made the best choice? I've just been scolded by my 9 year old. I think of all those over-dinner conversations she must have heard about my struggle to give into the very fact that I am not the Messiah and I shouldn't and can't and don't want to do it all, all the time. I want to teach her that rest is good and holy. I want her to know that having fun is a requirement for an enjoyable life. But if how I spend my own time does not reflect this, my words are hollow. I didn't realize how much they paid attention to my time-spending habits until two weeks ago when I let it slip that I was scrapbooking again while they were at school. Hannah looked at me with disbelief...You scrapbooked today? You? The concept of mom setting aside time to do something fun and crafty and non-work related blew her mind. My children have an entire bookshelf filled with scrapbooks I have made for them, but two years ago, when I really started writing and blogging and speaking, it all came to a halt. If I am not careful with how I spend my time, I could very well be setting the wrong tone for ministry. Because right now, they might think that ministry is a draining work, a never ceasing cup pouring out. Something that steals all your time for fun. God longs to fill the dry cup. And not only fill it, but fill it overflowing. But I have to choose to let Him do this. And this is the best choice. How does God fill your cup overflowing? Do you intentionally carve out time to let Him do this? Welcome to Soli Deo Gloria! This group exists to empower women to authentically share their hearts. Want to learn more? Click here to find out ways you can be involved here. Before you leave, take some time to visit a new friend. If you decide to link up, be sure to stop by your neighbor's place. We want to make sure everybody at this party feels a little love! 1. Your sentence needs to start "I..."
2. Your response should be 10 words or less. 3. You need to write the first thing that comes to your mind. How does this relate to our study of John? The Jews heard about John the Baptist and his crazy ways. They sent priests to check him, even the Sanhedrin, not only because his ways were unorthodox, but because they were worried he might be a false prophet. The first question they ask John the Baptist is the same question I asked you here. But John doesn't answer with his role or an adjective. He doesn't list his credentials, even though he has them. He is a priest by descent, but he doesn't use this to prove his place or give credence to his actions. "I am not the Messiah." And I wonder if I thought about myself in these simple, and yet profound, terms, how much my perspective, expectations, and general life might change. This weekend, we were honored to attend a wedding for a family member. Since we were coming in from out of town, we also attended the rehearsal dinner. The wedding was semi-formal, but the party was casual. As such, between the four of us, we had a total of 15 pairs of shoes. Ridiculous, but true. With all of this outfit coordination and weather changes, I inevitably forgot things. Like my eyeliner. And all my jewelry, save the wedding ring on my left hand (which, my husband pointed out, was the only important piece anyway). I thought about dropping by the mall to pick up some pieces, but since so many things broke in our house and cars this month, new eyeliner and costume jewelry just didn't make it into the budget. If my friends had lamented to me they had forgotten theses same items, I would have given them the eye roll and said "Who cares?? It doesn't matter. You are not the bride." (just like I am sure you are yelling at the computer screen right now). It all sounds silly, but how many of you get a little crazy about the little things? And maybe you do that because you disappoint yourself or others because you're simply not all you thought you would be this time around. I knew I was going to be teaching about this section of John (chapter 1:19-28) and so when I started to criticize myself, I would repeat I am not the Messiah. And when I started to become judgmental and critical of others, I would repeat They are not the Messiah. "a voice of one crying in the wilderness?" Can I be content with no one looking at me? Can I be content with just everyone looking at Jesus? Of course, I want to give a resounding "YES!" but this is not something that is lived out naturally for me. And how do I know this? Because after every class, I pick apart what I said and how I said it. And while I am getting better at not being so critical and just trusting that God did what He wanted, it's still hard not to think about what I said and what I did. If I am content with being just a voice, people's opinions of me will not matter. I will be content with the fact that God used me exactly the way He wanted to and that He will redeem anything that wasn't from Him. "The moment you start judging what you're doing, you're done." She's talking to one of The Voice contestants because the guy that's singing is simply thinking too much. He's constantly evaluating himself instead of letting himself get immersed in the music and in the meaning of the song. If I am trying to judge and evaluate myself as I am speaking and teaching my class, my focus in not on Jesus, but on me. And when I am focused on myself, I am done. 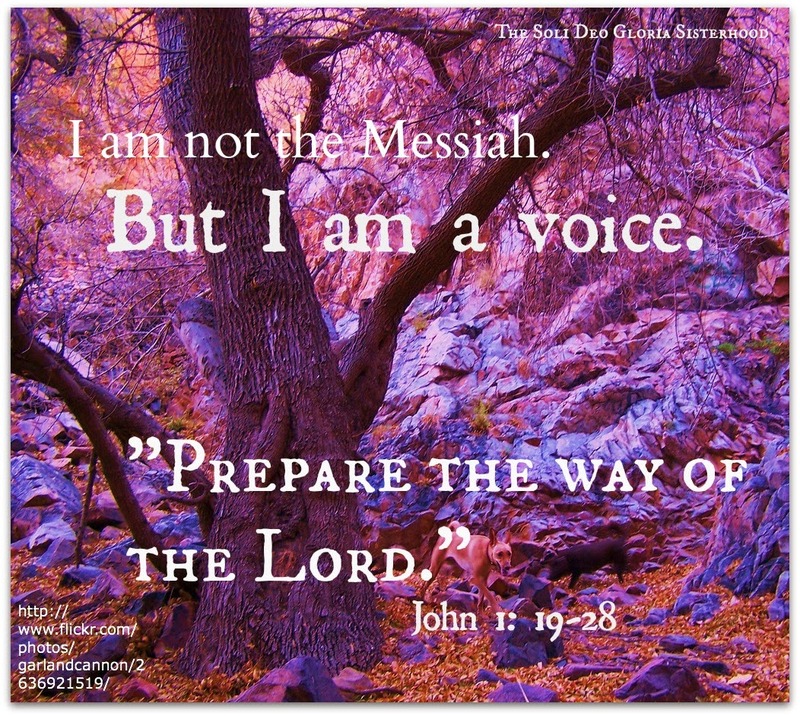 I have ceased to be fully committed to being just a voice preparing the way for Jesus. I am too busy preparing the way for myself. But I am not the Messiah. And to believe that, I need a heavy dose of humility. To see myself as a reflection of His light. He is the sun. All I can be is a moon. My light is not possible without His. Your turn to get introspective: Where are places you are exceedingly critical of yourself? Of others? When you imagine yourself as a "voice crying in the wilderness," preparing the way for Jesus, what is stripped away? Linking this on Monday with Michelle and Jen too! Are you new here? Welcome! We'd love to shower you with some love and encouragement, so if this is your first time linking up, will you put "I'm New!" as your caption under your linky picture? 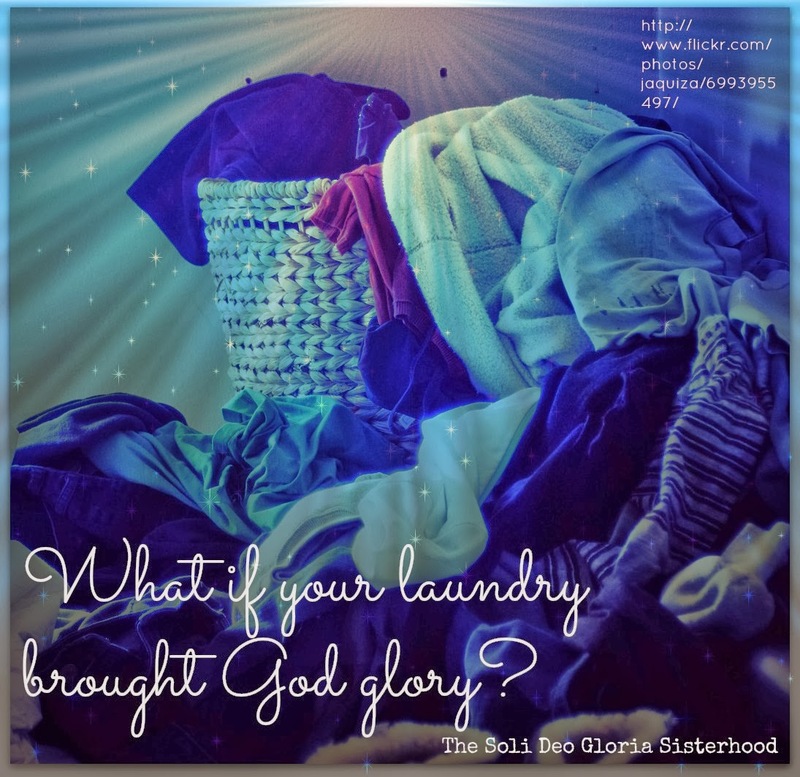 Want more info on what this sisterhood is all about? Click here. Want to show a sister some love? Tweet her post using the Twitter handle #sdgsisters. Make sure you check the # later for some great posts to read! SDG Retreat Registration closes November 1st! Only a few spots left! Click here for more info & the link to register. When I’m busy, exercise is the first thing to go. I say, “I don’t have time!” The truth is, I have time, I just don’t make time for exercise. I choose to spend my time doing other things. So when my son signed up for the 100 Mile Club at school, guess whom he invited to run with him from 7:10 – 7:30 a.m.? I don’t know if you’ve ever tried to say “No” to a happy, energetic, and front-toothless 6 year old, but it’s hard. “I don’t have time!” wasn’t an option. Five laps around the softball field equals one mile. We always do at least four. Our record is six. It’s The Tortoise and the Hare come to life. I encourage my son to jog, “Slow and steady wins the race.” He prefers interval training: sprint, walk, sprint, walk. I try to keep up. What I’ve learned, lap after lap, is that even little bits of time count. Just like the laps, the time adds up. Those twenty minutes, many of which I spend watching my son fly away, are building our mother-son bond. Because one day he will fly away. One day (soon, I fear) he won’t ask me to run with him. He won’t want me there, chatting with his friends, chasing and coaxing. He’ll choose to spend his time differently. And then, in hindsight, I’ll see so much more clearly, the gift of little bits of time. I don’t want to only see in hindsight. For this motherhood journey, for all of life, I want to see what I should see, now. God doesn’t promise us huge chunks of time in the future to do everything we dutifully intend to do . . . at some point. He gives us each moment. Moment by moment – that is the gift. I get busy, and I take much of it for granted. I count on the future, and I neglect to say, “Thank you, Lord,” for the present. I discount the little bits, but not as much as I used to, since I started running. So, thank you, Lord, for the little bits. Thank you for showing me that I really do “have time,” and help me to use it wisely. 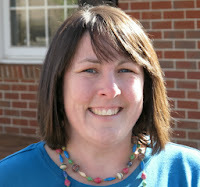 Courtney lives in South Carolina with her husband and two sons. 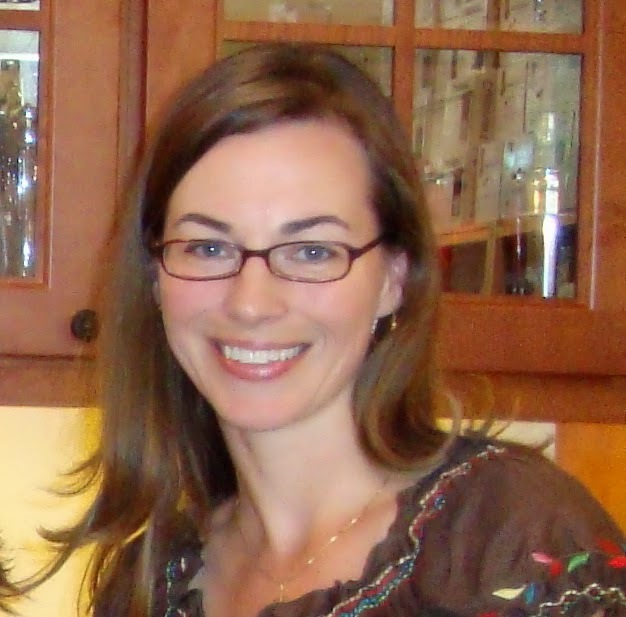 She blogs at A Work in Progress, where she writes about faith, motherhood, working, wine-making, books, and whatever else comes to mind. Linking with Emily, Michele and Women to Women today. Jesus touched people. He healed people. He ate real food and drank real wine. He walked on real water and He spoke in a real voice. He cried real tears and spilled real blood. And while I'm grateful to live in an era where I have a machine to wash my dishes and my clothes, I'd really like Jesus to come knock on my door in the flesh. I want to feel His arms around me. I want Him to dry my tears off my cheek. I want to audibly hear His voice when I'm confused and frustrated and alone. The truth is, I was planning on skipping this verse and move right into the identity of John the Baptist. In fact, I had the whole class planned. But then, the next day, I rediscovered verse 14 and God spoke to me, while not audibly, in a very real way. As I reread it, I was struck by the word home. Jesus didn't just appear and order people around. He didn't just stand at the pulpit and delegate responsibilities. 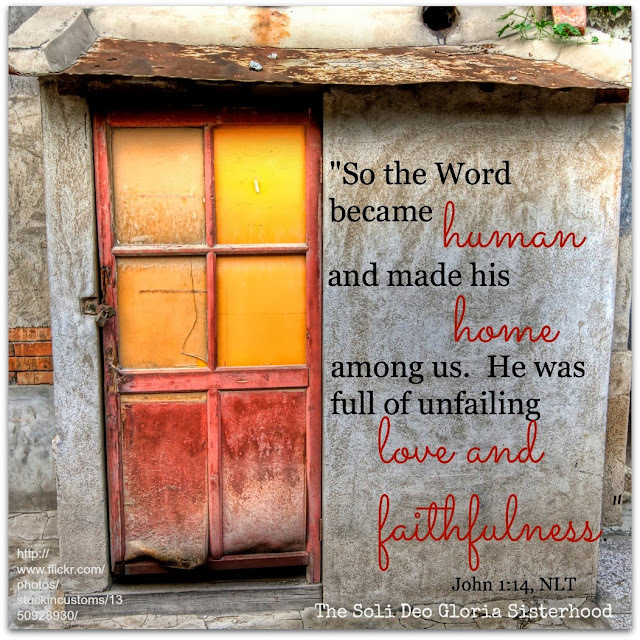 He made His home among us. He dwelt among us. I know what it's like to make a home. To arrange things to make it comfortable, inviting, and warm. I display things to remind me of important lessons I'm learning and to help us all remember for whom we live and why. I know how to make people feel welcome and put them at ease. But this verse makes me pause and ask myself this: Is Jesus at home with me? Would He feel at home with me? I think Jesus is always comfortable with who we are. He's God. He doesn't get intimidated or self-conscious. But I think we can learn a lot from taking stock of how we treat Him in our life spaces. Picture Jesus at the door to your house. He knocks and you open it. Do you invite Him inside? Do you step out on the porch with Him? If you ask Him in, into what area of the house do you go? You notice He has something in His hands. Gifts of love and faithfulness, but we'll call them flowers and a warm loaf of bread. He holds them outstretched. What do you do with the gifts? Do you receive them? Do you say they aren't necessary? Do you immediately put them away? Do you hold them close? Do you say "thank you?" He's still standing at the front door, but He wants to see the house. What do you show Him? What do you not show Him? What doors do you open? What doors remain shut? You choose a room and sit down. What is the first thing you would say? Do? Your family begins to come home. What unfolds? Does Jesus become part of the family or does it feel more like He's an awkward guest? You think back to that phrase in Jesus Calling: "Because I am always by your side, the briefest glance can connect you with Me." Do you catch yourself looking at Jesus as you go through your day? Or do you stay in your own head, working out scenarios, fixing your own problems? There aren't any right or wrong answers here. It's a process of exploring your relationship with Jesus and where you are right now. We all have parts of our hearts that we've walled off at times, but we must keep revisiting those doors with Jesus to check in to see if we're ready to fling them open. When I did this exercise, I found a door that was closed. It's called Pleasure. It might sound rather silly to you, but the truth is, I don't really know how to pursue fun on my own. I haven't entertained that life should be enjoyable for me. It's one of those things where I totally believe it for other people, but haven't been able to go there for myself. And to be honest, I've felt a bit like a robot lately -- a machine that exists to do things. And this can happen, apparently, when one gets so focused on work and productivity and need-meeting. When one doesn't know how to make one's own fun, or know what is truly enjoyable and leisurely, it can be easy to turn to just what comes easy and for me, that's work. Jesus wants me to open this door called Pleasure and enter in with Him. But this takes a willingness to give up some time for work. To risk missing deadlines and planning time. I fear I'm going to lose my self-motivation and my house might get a little too messy for my liking. But on the other hand, this robot life is for the birds. It's time to fling open the door and be free. Thoughts? If you go through this exercise, would you share what happens? Just a glimpse, perhaps? Did you see? SDG Retreat Registration is LIVE! Click here for more info & the link to register. After I get back from a run, my clothes are usually drenched with sweat (I'm sure you wanted to know this). And so I kind of hang them on the linen closet doorknob or spread them out a little on the floor instead of putting them in the basket because, well, ewww. But then, I notice if my clothes are there, even if it's for a legitimate reason, certain other people who also share said laundry basket starts leaving his clothes outside the hamper, too. Pretty soon, there's a half-filled basket and a large pile of clothes outside of it that makes it impossible to close the closet door. And perhaps, it might not be a bad thing in the metaphorical sense. So often, we try to stuff our dirty stuff in the closet so no one will be able to see it (or smell it). When it's time, we take it out, try to sort through it, wash it, dry it, iron out the creases so we look and feel presentable again. But, sometimes, we still don't want people to know that our clothes were dirty. But what if allowing people to see brought God glory? What if letting it hang out gave you more freedom than you thought was possible? What if not stuffing it in the closet or appearing perfectly organized and happy BUT BEING FULLY REAL, changed somebody's life? Maybe laundry isn't so trivial. I'm sure most of you know about Twitter. And Facebook. Probably Instagram, too. But there are other social media outlets your kids might be plugged into of which you have never heard. The standard rules of "don't give out personal information" or "don't chat with people you don't know" and "keep your passwords private" just aren't enough. 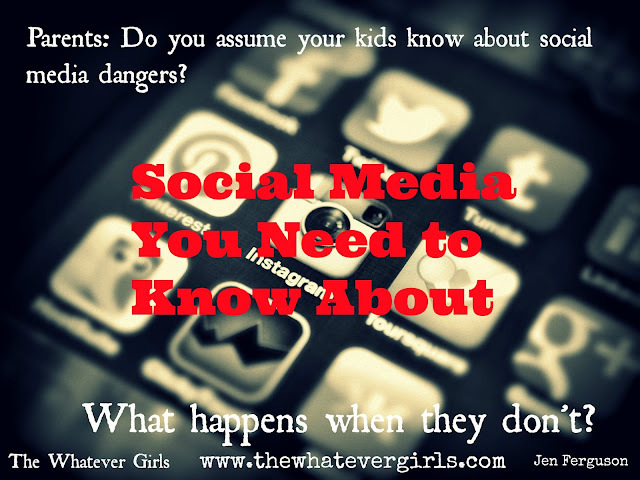 These social media outlets have dangerous facets, which some of our kids might not process through entirely. They need our help to navigate these territories. In order to do that, though, we must be educated on what's out there. God’s got this. He’s mightier than the government that has shut itself down with inaction. He holds my kids and their moods and their growth in his hands. He reigns over my to-do list and all the minutes of my day. He gives dreams and convictions and life. And he does it all at just the right time. His time. I learned this most profoundly when I spent two years praying and trying to become pregnant. I was ready. My husband was beyond ready. I finally said it was time. God said wait. As we waited, God worked. In the time I was having vials of blood tested and we were visiting an infertility specialist, God was orchestrating a story that made me a momma in a way I never expected. We adopted newborn Cate less than nine months after we stopped trying to become pregnant. Like so many times in my life, I could see God move when I surrendered. I still rush around more than I should, thinking I’m really in control of what I can accomplish. I get sucked into projects when it’s people I really need to see. But then I notice my daughter’s big, brown eyes and remember God’s got this life of mine in his hands. It’s time – my own that really isn’t my own – that has convicted me of living more intentionally. I want to use my time in whatever ways God has planned for me. For me, that meant clearing off some tasks and commitments off my calendar because they weren’t best for me – at least not right now because of those big, brown eyes and the younger mischievous blue ones that joined our family when God’s time was right for our family to grow. 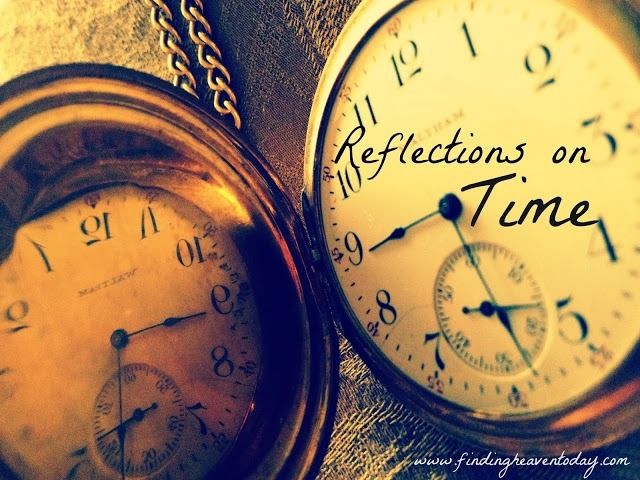 Time is about being intentional and attentive. Perhaps it’s just as well I don’t wear a watch because it would probably just distract me anyway. Kristin Hill Taylor lives in Murray, Ky., with her husband, Greg, and two kids – 6-year-old Cate and 3-year-old Ben. She can often be found trying to beat her husband in Words with Friends, playing games of Settlers of Catan with her best friends, listening to her daughter’s stories, reminding her son to be careful, or texting her friends. She believes in taking road trips, living in community, and documenting real life. You can keep up with her at www.kristinhilltaylor.com or follow on her Twitter.